Post sponsored by the French Ministry of Agriculture. See below for more details. And so, these crepes are a bit of an updated nod to bringing French culture home. We eat savory crepes quite often and the roasted tomatoes tossed with a hazelnut-butter dressing might be my favorite summer treat. 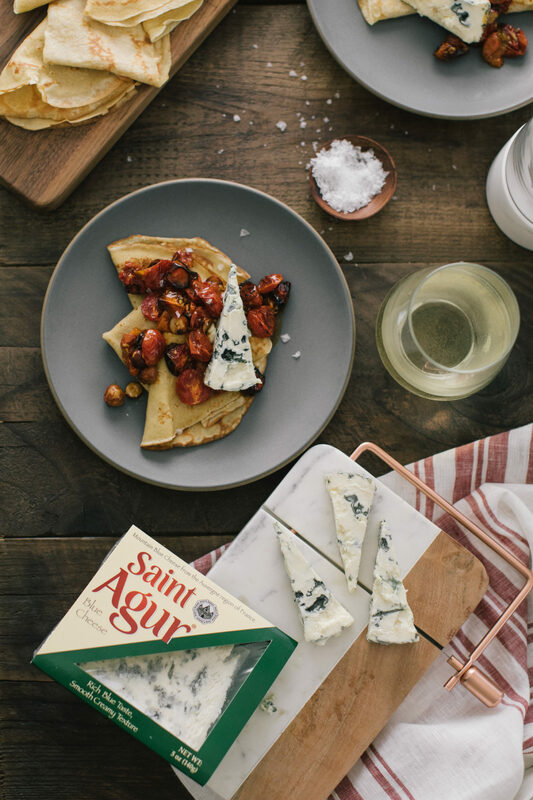 When served warm, the St. Agur blue cheese melts a bit into the tomatoes and it’s so rich and delicious. 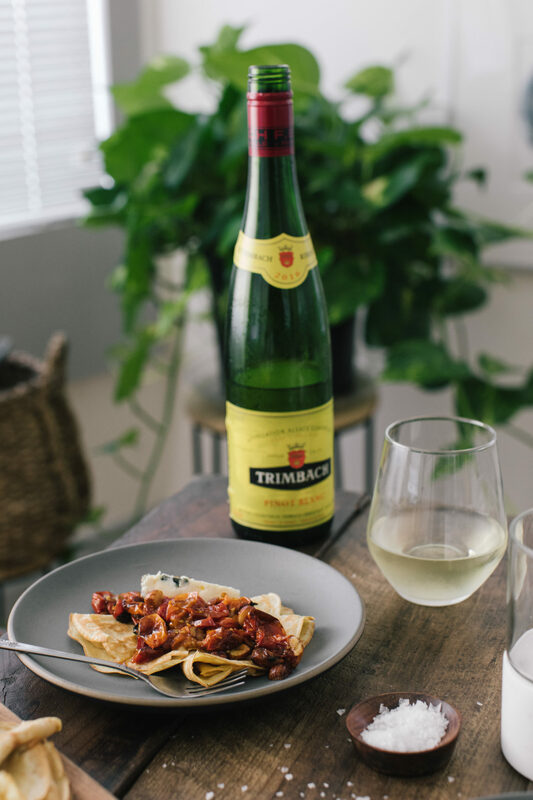 What really brings this meal home is the Trimbach Pinot Blanc. The wine helps balance the richness of all that wonderful President butter and St. Agur blue cheese. Best of all, you can make an extra large batch of the crepes to use throughout the month (they freeze amazingly well). Have these beautiful savory crepes for dinner then have a breakfast crepe or dessert crepe the following week. 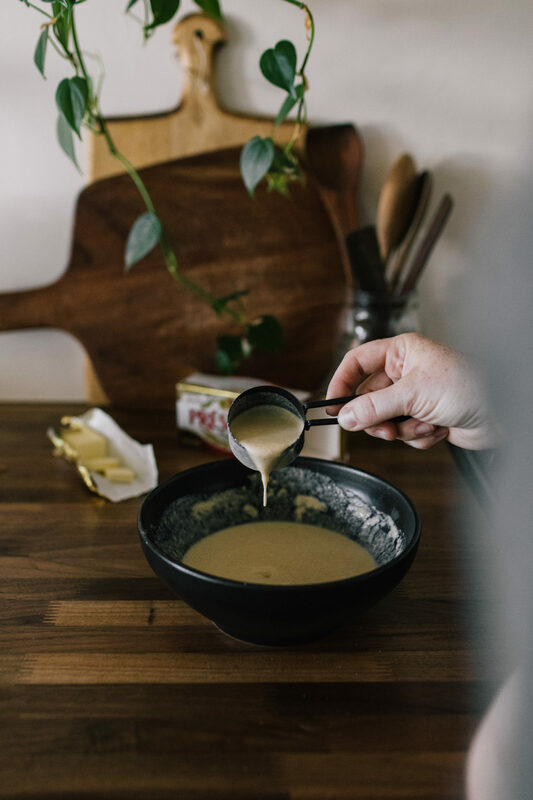 Or, if you’re like me and have a child- a bit of nut butter and honey spread instead a crepe makes for the perfect snack! Nuts: The hazelnuts have such a lovely play with the tomatoes but you could also use pecan pieces. I like using nuts that have a stronger flavor/presence. Oat Crepes: If you’re looking to make this gluten-free, try your hand at these oat crepes. A favorite of mine and still easy to make. Greens: I resisted the urge to toss the tomatoes with greens but if you wanted to add a bit more to these crepes, toss the tomatoes and butter dressing with a handful or two of baby spinach. 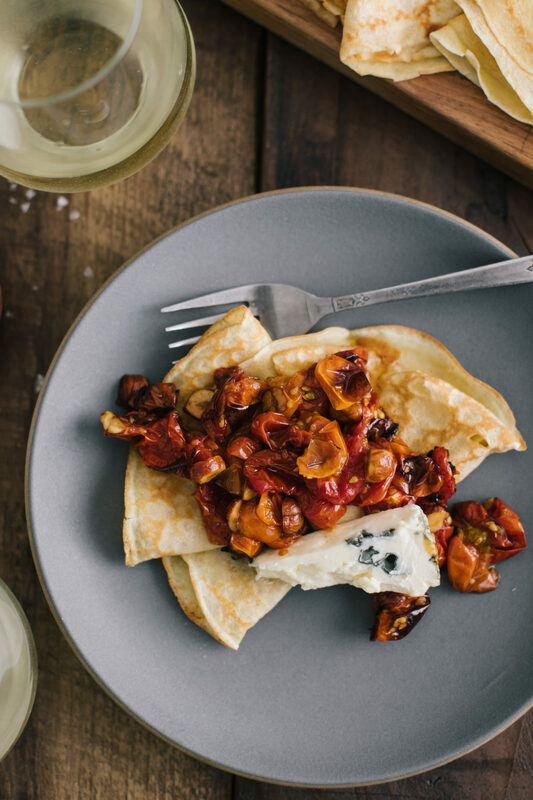 These delicious, savory crepes are topped with roasted cherry tomatoes tossed in a hazelnut-butter dressing and served with a soft wedge of blue cheese. Make crepes according to directions. Heat your oven to 425˚F. Half cherry tomatoes and place in a roasting pan. Toss with olive oil and a pinch of salt. Roast until charring and most liquid gone, 30 minutes or so. To make the dressing, melt the President butter in a small pan. Add the crushed hazelnuts and cook for 2 or so minutes, until the hazelnuts are toasted and fragrant. Remove the pan from the heat and add in the lemon juice, honey, and salt. Swirl to combine and let cool slightly. When tomatoes are done, let cool slightly then combine with the dressing. Divide the crepes onto three or four plates and top with the roasted tomato mixture. Top with wedges of the St. Agur blue cheese and a sprinkle of sea salt. Tips and Tricks: Make the crepes ahead of time and freeze to use as needed. Disclosure: This recipe was created in partnership with the French Ministry of Agriculture. All thoughts and opinions are my own. It’s content like this that helps me keep this site running to provide the vegetarian recipes you see every week.